Generally when the ball is new and hard, a conventional swing happens and very rarely a reverse swing happens. A genuine reverse swing happens when the ball actually is old in such a way that one side of the ball is rough and other side of the ball is smooth. Generally there are two types of reverse swings, one is Reverse Inswinger and other one is Reverse Outswinger. In reverse inswinger the left side of the ball will be rough, the right side of the ball will be smooth and shiny, and the position of the seam will be in the direction of slip region. This implies, the ball is uneven in weight and character. In general the reverse swing depends on character of the ball, character of the air and nature of the pitch. When we speak about the character of the ball here, the left side of the ball will be less weighed as it is rough and the right side of the ball weighs more since it is smooth and shiny. 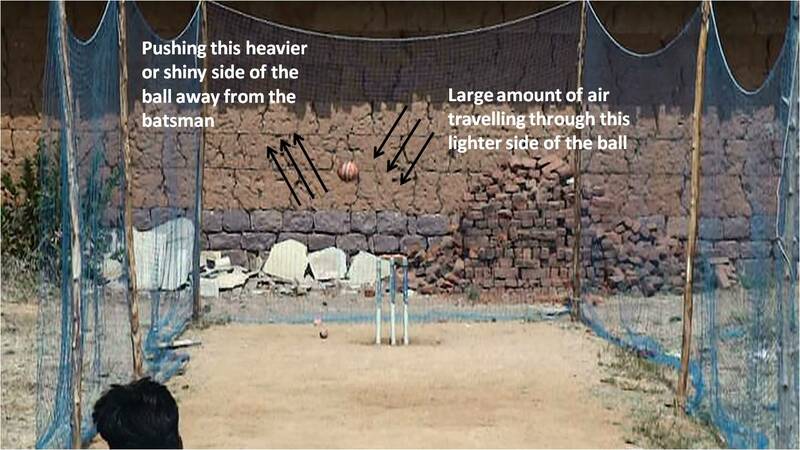 Here comes the concept of character of air, when this uneven odd ball cruises in the air, the distribution of the air ( opposite flow of the air ) behaves differently compared to the new ball where both sides are even (conventional swing bowling). 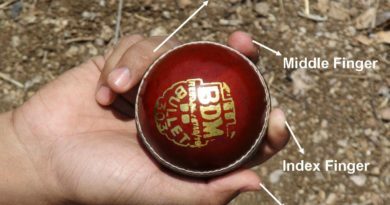 In reverse inswinger, the ball with the seam position facing towards slip region is projected (pushed or delivered) towards outside the off stumps region, therefore now since the left side of the ball is rough and weighs less than right side, the more space or you can say the more area will be created for the air ( opposite flow of air ) to travel, which infact implies, the distribution of the air will be more on left side or you can say the large amount of air will travel on this left side of the ball which ultimately pushes the heavier side (shiny right) of the ball to opposite direction which is nothing but reverses lately into the right handed batsman. This is the reason why a ball reverses in the air into the batsman. 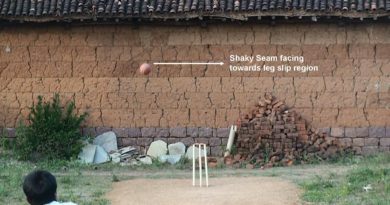 And since the ball with the seam position facing towards the slip region is pushed outside the offstumps just like as we do for conventional outswinging delivery or aimed for outswing, but magically moves in opposite (reverse) direction into the batsman rather than moving away from the batsman, is the reason why we use the word “reverse inswinger”. Even, let us say for example if the left wing of the plane is crashed in the air, the large amount of air will travel to this left side, since the more space is created on this left side, which ultimately pushes the plane to heavier side direction (Right side).